A scenic, vertical picture taken of Wailua Falls which is located in Kauai, Hawaii. 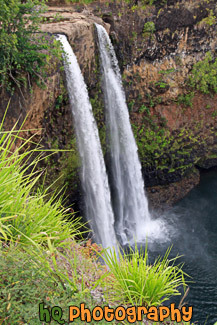 Wailua Falls is an 80-foot tiered waterfall located close to the roadside lookout for everyone to enjoy. The falls became famous when it was featured in the opening scene of the popular television show, Fantasy Island.